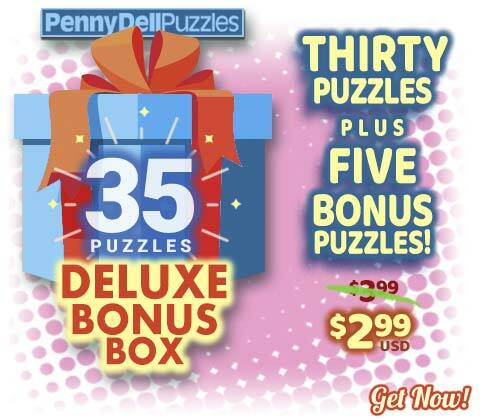 Two Fantastic Puzzle Packs Now Available for the Penny Dell Crossword App! That’s right, we’ve got another bonus blog post for you, fellow puzzlers and PuzzleNationers! I know we just announced our October deluxe set and our special Bonus Boxes on Wednesday, but guess what? That’s not all that’s new and available for Android AND iOS users of the Penny Dell Crosswords App this week! Value Pack 2 is available right now, and it features 150 hard puzzles for ambitious solvers! That’s even more than we offer in our Deluxe bundles! When it comes to value, this pack is tough to top! But if you’re ready for a real challenge, then the Mega Pack is for you! We’re talking about 300 hard puzzles, double the puzzles in Value Pack 2, each guaranteed to contain the clever clues and topnotch grids PuzzleNation is known for! When it comes to puzzle apps and fresh content, you simply can’t go wrong with PuzzleNation! Whether it’s an October-themed puzzle set, Bonus Boxes to keep your skills sharp, or Value and Mega Packs loaded with topnotch puzzles to enjoy, PuzzleNation has got you covered.